A little while ago I came across a recipe from Simply Gourmet Photography for Homemade Breadsticks. What caught my eye? That homemade breadsticks could be ready to eat in about an hour. I was sold. I tried them. I loved them. My family loved them. After making this recipe a few times a lightbulb went off. What if I could adapt this easy recipe into a new spin-off of my Cinnamon Rolls. 1. In a large mixing bowl, dissolve the yeast, sugar, and water together. Allow it to sit for a few minutes until bubbly. 3. On a generously floured surface, place the dough and allow it to rest for 10 minutes. 4. Meanwhile, in a 15x10x1-inch rimmed sheet pan, melt 8 tablespoons of unsalted butter in a 375 degree F oven. (Do not try and skimp on the butter. There is no fat in the dough so feel free to justify the use of all this butter.) Remove from the oven before it begins to brown. 5. In a small bowl, mix your cinnamon mixture together along with 2 tablespoons of the melted butter from the pan. Mix until it resembles wet sand. Set aside. 6. Roll the dough to fit the rimmed sheet pan. With a pizza wheel, cut strips about 1 1/2 inches wide. (I usually get about 11-12 bread sticks.) Dip each bread stick into the pan of melted butter. First one side, then the other. Line the breadsticks up next to each other until you've got them all on the pan. 7. Cover the bread sticks with the cinnamon mixture and allow them rise for about 10-20 minutes on the warm sheet pan. 8. Bake for 15-20 minutes. Meanwhile, prepare the glaze. 9. Allow the bread sticks to cool for 10 minutes before frosting. Extra frosting can be thinned with more milk and used for dipping. That looks really good I'm pinning it......I'd love for you to share this and any other recipes you'd like @CountryMommaCooks Link & Greet party...Have a great week! I can almost smell it through my screen! Can't wait to try it. These look perfect for the kids on a school morning, nice little sugar rush to help them through the day! 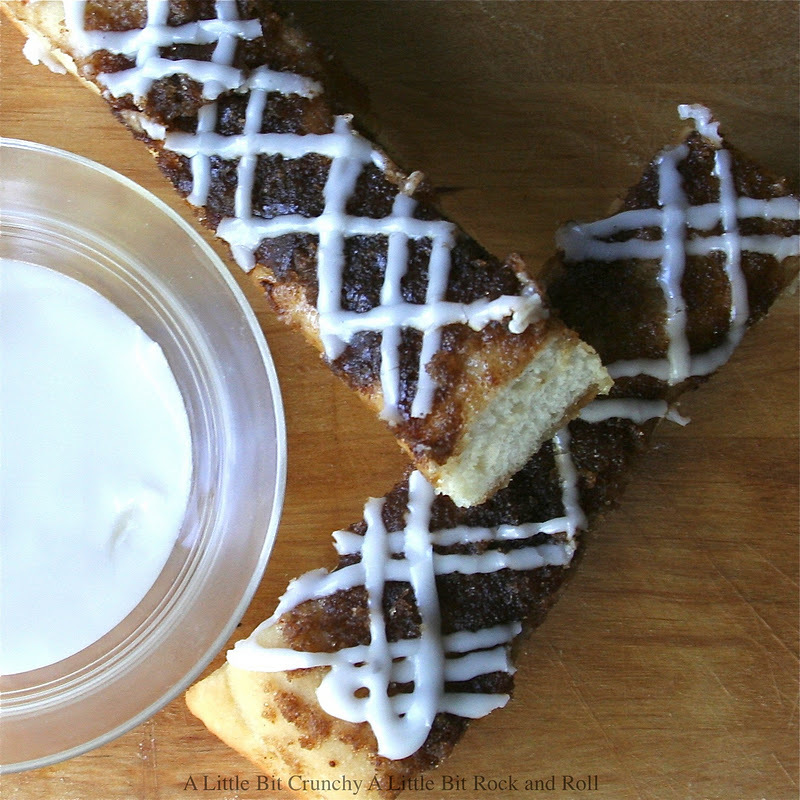 Yup totally genius idea to make sweet roll sticks!!! I just want to reach into my screen and grab one!!!! I can only imagine how great these are!!!! Thank you for sharing with Trick or Treat Tuesdays!!! I love these. Any time we go to the Pizza Hut buffet, I have them! And yours look even better! Thanks for sharing at Church Supper. Have a blessed week, and see you again next Sunday! Thanks for posting this! It looks great! I am always looking for recipes for our Sunday morning church potluck. I am sure these would be popular! I found you through the Fri Potluck Feast (formerly Linky Friday). My son would love these! They remind me of French toast sticks! This is my first week linking up with Weekend Potluck and I am loving all the fabulous foods that are out there. Wow, not only do they look delicious, they look so pretty! Love you blog! Just Got them out of the Oven! they look so Yummy! can't wait to taste! Thank you for sharing this! I gave your version a try and ran into some trouble...I'm not sure what I did wrong. I tried them again with a different version and they turned out looking like your AMAZING photos. 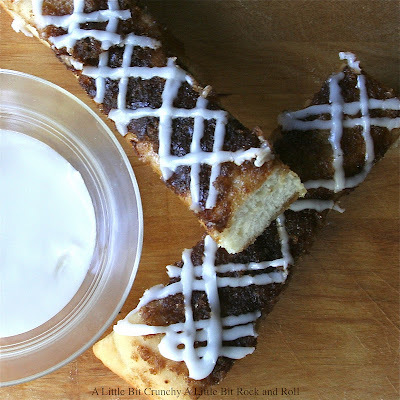 (I did a blog about it if you want a peek - http://joandsue.blogspot.ca/2012/11/browned-butter-cinnamon-bun-breadsticks.html# ) Thanks again for sharing this wonderful idea!